Yes - There's some excellent videos on YouTube of British Railways in the 50s and 60s and I was surprised to see footage from Euston showing a Royal Scott class with LMS on the tender dating from the 50s. Old Man Phil wrote: The Type 40s were known to us oldies who saw them introduced from new as D two hundreders..
One immediate observation is that both crossovers between the running loops face the same way so once a train has swapped lops there's no way to get it back. Incidentally I agree with what others have said there's too many sidings and no run rounds. PeterH wrote: They are the newer Hornby tooling Gresley teaks. One full brake, two brake composites, two Firsts, 4 thirds and a buffet car. Re: South West Herts. MRS - P.3; Butler Henderson video. 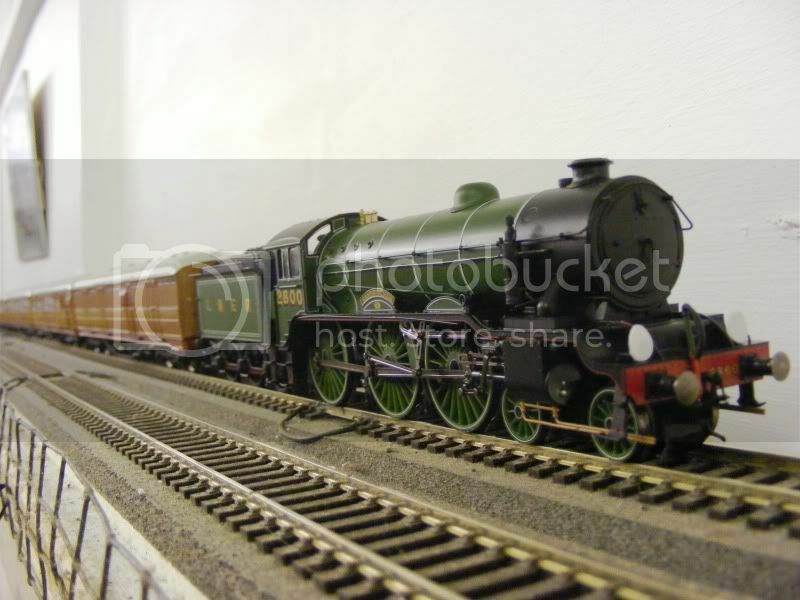 PeterH wrote: The new Hornby B17 2800 'Sandringham' being put through its paces. At long last after having it on order for over two years! It does look particularly good with those teak coaches, what are they ? Very realistic indeed, one additional touch would be to clear an area of the rear windows to simulate the arc of the wiper blades. Topic: general order of building a layout. Re: general order of building a layout. OOI - is Pendon still considered one of the foremost models in the country? It's 25 years since I've visited. Sorry to ask a simple question but what was the actual purpose of the raised section (was that specifically the clerestory or is that the general style), even the underground built them but I've never known the reason why. Surely as standard style roof would have been easier to build? Topic: What Film themed train pack would you like to see? Re: What Film themed train pack would you like to see? why not a Murder on the Orient Express set with proper Compagnie Internationale des Wagons-Lits coaches. Surely for rugs and carpets you could find images on the Internet, copy them into your chosen picture software and then shrink them down before printing? By the way, I'm aware that they did retool the Hall specifically for the Harry Potter franchise- but that's a little different, since it has huge international appeal still. .